I am addicted to books. Seriously. And one of the worst things an addict, like myself, can do...is go to a bookstore. I don't think I've ever left a bookstore without buying a book,...and it's usually more than one. I don't buy one "lightly" either. I don't buy...just to buy. It might take me an hour or more to decide on "just the right one" or to collect a few and then decide which ones I think are best. I had plans to meet up with friends, but when my friends said we should all meet at this big, beautiful bookstore, my first words were, "Now, y'all know I can't go in there. You KNOW what's going to happen. I'm going to HAVE to buy some books." They just laughed at me and told me I'd be fine. They know me better than that - I was not going to be fine. We were going to meet at a BOOKSTORE. I think bookstores are so beautiful. It doesn't matter what kind they are, I love them all. I love old antique bookshops, second-hand bookstores, children's bookstores, and little market square booths of books. They are precious, wonderful, magical places. No surprise there, right?! Dang, I'm good! Oops, there's another. Let me see...don't know the author, but...(reading the summary)....sounds good. Nice set-up. No praise quotes from the ignorant magazine book reviewers...that's a good sign....yep, it's a keeper. Now, let's find the speciality tables that are set up for browsing: New Fiction, New in Paperback, Classics, Seasonal, Readers Recommend, New Authors, Staff Recommends,...oh, goodness, it's delightful! The school year just started, HOW I am going to read them ALL?!?! I can't. I can't read them all...right now. 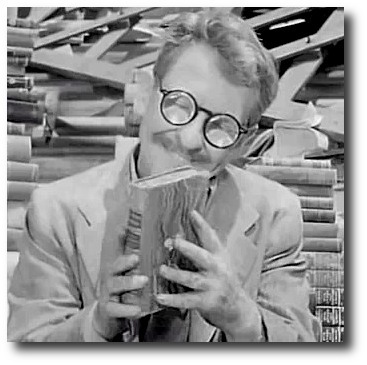 I'm turning into Burgess Meredith from an old Twilight Zone episode. Breathe, Kim, breathe. Pace yourself. Think this through. Now, normally, I don't try to resist. I do try to budget, but I'm never happy leaving a bookstore empty-handed. Oddly enough, something in me decided it was time to fight my addiction. It was getting a bit out of hand. I began to think of all the wonderful books I have at home that have been on a long waiting list to be read. I thought about how many times I put another book, a recent purchase, in front of a book I had owned awhile. I thought of Patrick Rothfuss. I remembered how long I'd owned his book before I opened it up and found the wonderful world he'd created in The Name of the Wind. It sat on my shelf far too long before I gave it the time it deserved. I had ignored it for lesser books. I have many wonderful books at home that deserve to be read. I decided to walk around the bookstore and enjoy the atmosphere. I walked around every part of it, and I really enjoyed watching other people find books they wanted. I loved looking at the displays and browsing bookmarkers, magnetic quotes, and beautiful journals. In the end, I put back the two books I had picked up. I did note them on my phone for something I might like to purchase and read at a later date. I smiled a sad smile at the two books as I placed them back on their proper shelf. I had given them false hope by carrying them around. I felt I was abandoning them when they begged to be read. I knew, though, someone else would discover them. I was happy to see so many people in a bookstore on a Sunday afternoon. I felt sure those books would find a good home with another bibliophile. 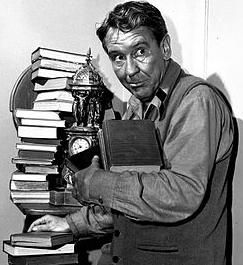 I so loved Twilight Zone and just recently rewatched the Burgess Meredith one ...when his glasses broke I cried. I'm farther along in life than you are so don't buy as many books but do check out several each week from the fabulous local library. AND, I have started to part with old favoites I had purchased by giving them to friends (my daughters didn't end up like the same type I did at their age) and then took a bunch to the Domestic Abuse Center for enjoyment for those women who just have not had that much in life....so far. What a great idea about sharing the books with those who need some reading joy! I've donated clothes and "new start" items before, but didn't think about books. Thank you for sharing that idea with me! I love it, and I'm sure the ladies in my book club will love it, too!